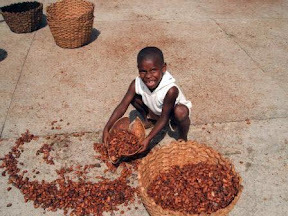 I have previously reported on the ethical dilemmas posed by eating chocolate, due to the trafficking and exploitation of children in growing cocoa in West Africa (see My pleasure, their misery? and Easter eggs and slavery), and on the responses to my letters to chocolate manufacturers (see Fair Trade chocolate – report 1). I have received some more replies, and have researched some more information, all of which is very revealing. I have received replies from three confectioners, and have researched a fourth on the web. As previously reported, Cadbury (Kraft) uses Fairtrade cocoa for its Dairy Milk range of products, and would like to expand that commitment to other products in its range, but is presently unable or unwilling to because of the small number of Fairtrade certified growers. Nestle Australia supports two “initiatives” – The Cocoa Plan, which is UTZ accredited and The Nestle Plan, which conforms to Rainforest Alliance & Sustainable Agricultural Network principles. Nestle says these programs provide for future sustainability of the cocoa industry and “acceptable labour practices”. Darrell Lea didn’t reply to my first letter, but replied to a second letter. Darrell Lea has “recently” joined the World Cocoa Foundation and sources cocoa from suppliers certified by FLO-CERT, the company that supplies Fairtrade certification, though this doesn’t necessarily mean certification to the same standard. Other cocoa suppliers are Rainforest Alliance certified. Ferrero Rocher has not replied to my letter, although, to be fair, the company has been the subject of an Easter campaign that may have generated a large amount of correspondence. Lindt has a lot of information on its website about “Social Responsibility”. Lindt sources its African cocoa from Ghana, where it claims a “progressive governmental cocoa organisation” facilitates tracking of all cocoa and just payments to growers. Lindt is also a member of the World Cocoa Foundation, but does not use Fairtrade cocoa because those sources cannot supply Lindt’s needs. Fairtrade appears to have more stringent labour requirements than Rainforest Alliance, UTZ and other certification schemes, but all these independent schemes guarantee better results than industry schemes. Chocolate companies have not, so far, been very open about exactly what their practices guarantee and how much (in dollar terms) they actually spend on improving labour conditions in West Africa. Much of the current action appears to be aimed more at improving production than in alleviating poverty, though it isn’t always possible to be sure. It seems likely that the companies are making improvements, but probably less than justice demands and that they have previously agreed to do. Consumers who care should continue to advocate for further action, particularly companies using independent certification with clear criteria, as is provided by Fairtrade. Mars uses Rainforest Alliance certification on Mars Bars. Cadbury / Kraft uses Fairtrade in its Dairy Milk range and Green and Black’s products. Nestle uses UTZ certified chocolate for Kit Kats. Ferrero and Hersheys are yet to produce a certified product. Aldi Just Organic is Fairtrade certified. Alter Eco, Chocolatier Australia, Cocolo and Heritage Fine Chocolate all have Fairtrade certified chocolates. Stop the Traffik chocolate campaign. World Vision guide to Fairtrade chocolate and coffee in Australia. Ethical consumers guide (includes more than just labour conditions). How to buy ethical chocolate. Chocolate makers’ websites: Lindt, Cadbury Australia, Nestle Project Africa. Will you join in advocating via letter or your choice of products? We may not always choose Fairtrade chocolates, but we can choose more. « Did Bethlehem and Nazareth exist in Jesus’ day?